The second day of the RYA Youth Nationals had a slow start before an action packed day of racing at Weymouth and Portland National Sailing Academy. The forecasted easterly wind was light and variable in the morning but increased and stabilised as the day went on. The 29er fleets launched early and completed their three scheduled races in the harbour while the others waited for wind in the bay. Eventually, the wind did come in and the Laser fleets started racing at 13.30. The 420s and Spitfires started racing at 14.00 in the harbour, after unsuccessfully waiting for wind further out. It was a day for smart calls on the water, with what sailors described as light, patchy and shifty winds across the courses. After three hours of waiting for wind in the bay, the 420 class returned to the harbour for two races in the afternoon. Sarah Norbury (South Staffordshire SC) and Mari Davies (Pwllheli SC), defending girls Youth National Champions, explained the different mind-set that was needed following the change of course. “We had to think on our feet of what sailing in the harbour would give us that was different to sailing in the bay; today involved a lot of thinking,” said Davies. So far the week is going the right way for Martin Wrigley and Marcus Tressler, who take the leader’s yellow sail spots, with a five point advantage, from Max Clapp (Royal Southern) and Ross Banham (Bewl Valley SC). With only three races on the board for the 420 class the title chase is far from over. The Lasers spent the first part of the day playing the waiting game. After three hours, the race committee commenced with a race in five knots of wind across the bay course. Michael Beckett (Solva) led from the start but had a small match race towards the end with rival Henry Wetherell (Beaver SC). The pair seem closely matched wherever they race. Beckett finished just three places ahead of Wetherell at the Princes Sofia Trophy in Palma last week. Karyna Manuel (Grafham Water) is currently storming the Laser Radial girls’ fleet, finishing second in today’s only race she now leads by 11 points to Hanna Brant (Oxford SC) and Ellie Brown (Beaver SC) in second and third respectively. Manuel took the advantage at the start, however lost out to Liz Sherwood (HISC) down the final run as the breeze filled in slightly on the right hand side. Local sailor, Sam Barker (Castle Cove SC) and Victoria Akhurst (Pwllheli SC) displayed their expert knowledge of the harbour by winning both races today. 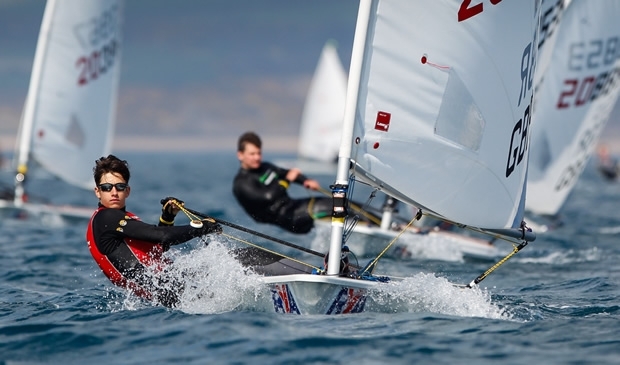 Barker, defending RYA Youth National Champion enjoyed the day of tricky conditions. Bobby Hewitt (Leigh & Lowton SC) and Harvey Martin (Ogston SC) top the overnight standings in the 29er class. The 15-year-olds once again showed their light winds prowess, winning the first two yellow fleet races. Sutton sailors Dan Venables and Patrick Keech are just two points behind as the event now splits the fleets into gold and silver. A successful day sees Rowan Edwards (Pwllheli SC) and Daniel Blight (Port Dinorwic SC) jump up the leader board in impressive style. The pair moved from 16th to third after three top five results, including a win in the second race. After a steady day of racing, Anna Prescott (HISC) and Eve Townsend (Emsworth/HISC) are happy to be leading the girls and sitting in fourth overall. Emma Wilson (OTC) celebrated her 16th birthday today with a win in the last race, becoming the only person to beat brother Daniel so far this week. Despite being overcome by his sister in the last race, Daniel Wilson (OTC) remains dominant and has a six point lead going into Wednesday.